To raise funds to help areas in the Caribbean devastated by Hurricane Irma, Ideal Credit Union, in partnership with the Worldwide Foundation for Credit Unions, launched a two-week drive from October 6-20, 2017, to encourage donations from members, employees and the community at large, and pledged to match up to $2,500 of the money collected. 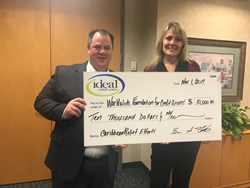 Ideal CU President/CEO Brian Sherrick & EVP of Operations Alisha Johnson proudly pose with a check representing the credit union's $10,000 donation to Caribbean relief efforts. World Council of Credit Unions is the global trade association and development agency for credit unions. World Council promotes the sustainable development of credit unions and other financial cooperatives around the world to empower people through access to high quality and affordable financial services. The Worldwide Foundation for Credit Unions is the World Council’s official fundraising and gift-receiving organization. Contributions to the Worldwide Foundation help advance efforts to create long-lasting opportunities for communities worldwide. In particular, funds support World Council’s development programs, International Partnerships Program, Global Women’s Leadership Network, disaster relief and member education and training. Learn more at https://www.woccu.org.